Speed buff, to get places faster, and strength buff, to one-shot nearly everything. Sneak-move, then immediately jump, to jump ultrahigh. Scale trees, hills, mountains, and more! These are currently the only things in the vmod right now, but feel free to suggest more! Simply use MCEdit to import the tiny little schematic to your creative world. Just break and replace the redstone block that's on the end with four command blocks. Like them? Post on them! Say your opinion, or suggest more features! I don't see how this is useful at all, besides the speed and strength buffs. Besides that, all of this can be done already. High Jump: Just fly. It doesn't take that long. Magnet Mode: What's the point? You can just do "/tp @e[type=Item,r=20] @p" or "/tp @e[type=XPOrb,r=20] @p". Again, it's not that hard. Buffs: Kinda useful, I suppose. But can't you just use /tp or /kill? I say it yet again, it's not that hard. Don't think about it, just click on the first one that comes to you! Sometimes you might just need to high jump, and not fly. The magnet mode does the function constantly and automatically. It's not supposed to be hard, it's supposed to make the game easier and more functional for creative mode players. Don't like? Don't use. Thanks, goodbye. I'm not good with books, and these things are constantly running on a command block, so your inventory would be filled with books. I've gotten no positive reactions to this vmod. I think I should just take it down. No! Don't! It's quite useful, but you might want to make it vary a little, i.e. extra particle effects for fun, because why not? And get another coolgboy post? "It's not that hard. Seriously? Constant particles? It's not that hard. You can just type /particle smoke ~ ~ ~ 1 1 1 1 100 force, and keep repeating the command over and over again. It's not that hard. I don't care if this does it automatically and doesn't require you to type anything at all. It's not that hard. It's not that hard. It's not that hard." Maybe do something like this, but giving you all items that can only be obtained with commands. I.E. command block, barrier, dragon egg, etc. This vmod is fairly good, despite being fairly simple. Perhaps make colored sign text/ item names without plugins? Remember, everyone: this is simply meant to augment creative mode. I feel like it should be used in all creative worlds, as it adds very useful things. On startup give all players one book. 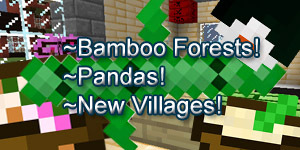 Want new mobs in vanilla minecraft? Can't be bothered with mods? To long a wait for the next update? Add a clickable sign to your structure, make it give the nearest player a book! I forgot where this .jar originally came from! I DID NOT MAKE IT AND IF YOU MADE IT PLEASE TELL ME! This will help with clickable signs! Edit: It won't let me post it, just google it. I think I can nest that somewhere. If there are any other unobtainable items you think should be put in the book, you must say so now. Well, "your opinion" provided NO suggestions, NO criticism, nothing helpful, it was just "meh command blocks are useless". If you don't have anything nice to say, don't say anything at all. I would have been more accepting had you provided anything about what I should add, or what I could rewrite. Redstone Is Simply Ease of Access in Minecraft. I tried that. Halfway through my Firefox ran out of memory and crashed, lost all of the work I'd had.